Jonathan & Amy: Weekend for the Girlies!! 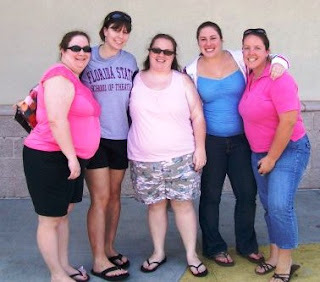 A group of my camp friends and I get together for one weekend a year and catch up. The past two years we met up in Sarasota, since that's very close to where most of them lived at the time. 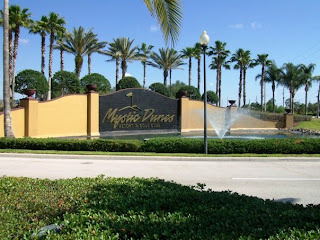 This year we planned a weekend at the Mystic Dunes Resort in Kissimmee. 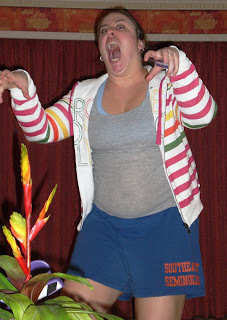 This is part of the reason that I was in Florida for so long. I picked up Megan from the Sanford airport (she flew in from Kentucky) on Thursday night and we stayed the night in Melbourne. Friday we had some time to kill (the others were carpooling from Bradenton after they all got off work and such), so we started the day off at Blueberry Muffin. I've been wanting to go for a while now, since it's a very local place and I miss their scrumptious pastries. I forgot exactly where it was, and passed it by about 2 miles before calling DJ and asking what intersection on A1A it was at. After that, Megan and I hit the mall, then the Avenues, then got some Chick-Fil-A. I filled up the tank and we waited around the house a bit, waiting for the call that the others had left (and then another hour for timing). 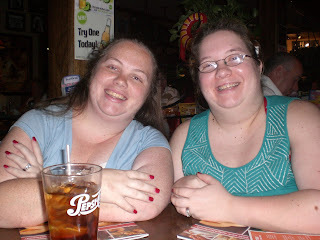 We all met at the resort (we arrived just as the others checked-in, so it worked out rather well), and promptly took off for Applebee's, our signature restaurant (one of the only places out by camp, LoL). Our waiter, Harry, was pretty amusing, but overall service kinda sucked (many problems with our orders, etc). I also didn't get the correct drink, but didn't know it at the time (it was a new summer special, and I ordered it again at Ebad's going-away dinner, and got something very different which was 2-4-1, tastier, and larger). We trotted off to Walmart to get some supplies, then back to the condo. The room was lovely. We booked a two-bedroom standard, and got a handicapped room on the first floor of building 32. 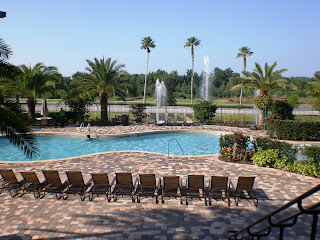 The resort is humongous, with a golf course and four pools, for starters. The only problem was that there were ants on our screened porch, which slowly migrated into the living room as well. 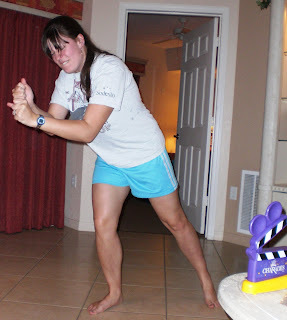 That first night we played Disney Charades, and it was SUCH a hit that we ended up playing ALL the cards in one sitting, which I've never done with any other group before. It worked out really well, and a good time was had by all. 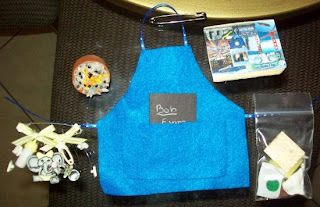 The other thing we did was exchange SWAPS, which is another Girl Scout tradition. Everyone makes one that represents what's going on in her life right now. Not gonna lie, some people really outdid themselves! It totally made me feel that my decoupaged wooden plaques were subpar, LoL. Saturday began with shipwrecks. 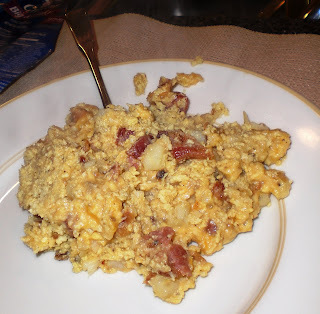 This is a Girl Scout breakfast which consists of frying bacon, cooking hashbrowns in the grease while someone else crumbles the bacon, adding eggs into the mix, then eventually the bacon and the cheese, and stirring it all together. Sounds gross, looks gross, tastes great. After that, we headed to the big pool, but it was overrun with kids so we went to another. 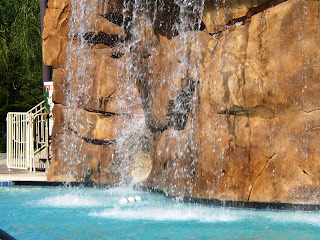 It was nice, and only 5 feet deep so nobody had to tread forever (like at some previous pools we've used). It also had one of those ends that just naturally ends, so we could lay in 6 inches of water, too. We ordered Pizza Hut for lunch (there was one on-site), and worked on our craft projects (yeah, can you tell we love us some camp activities??). We watched part of Fiddler on the Roof (we like musicals) and then headed out to the pool again. 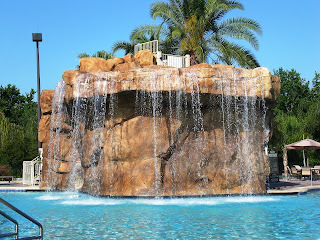 This time we went for the big pool, but we only spent about an hour out there. We went down this awesome boulder-slide, which was about 200 feet long, but it's completely in the dark, and as it twists around there's no way to know when to hold your breath before you hit the water, LoL. I insisted that we go on it nearly immediately, and we ended up going on it three times before we left. They needed a better lifeguard, as children kept swimming into the slide area (which, of course, is to be specifically just for those going down the slide), and I kicked one on my third run, since nobody stopped her from playing IN FRONT of the slide's exit. 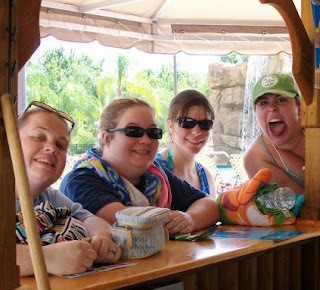 We laid out, got some color, and got some frozen drinks from the world's worst bartender. Since we're all big Phase-10 players, the playoffs came next. For some reason, it took longer than usual to complete the game, and shoo-in Megan ended up losing to Dawn. Then it was time for dinner, another GS specialty: hobo packs and dump cake. 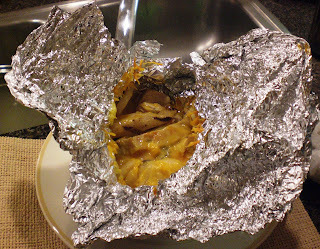 Throw chicken, butter, cheese, potatoes, and veggies into some tinfoil, wrap it up, and throw it in the oven and you're done. Similarly, dump cake is cake mix, pie filling, and butter in a pan (not mixed)... cover and bake. The night included a lot of talking, debating, and finishing up the pillowcase-decorating. I drew three pics per person, and random phrases for some as well. My own is adorable, and I can't wait to use it (forgot to take a pic of it). Sunday morning we did a lot of pictures, had breakfast at Bob Evans (with the worst server ever), and looked at some photos at Walgreens before parting ways. Dawn had to get to her brother's First Communion, Megan to the airport, and the rest of us back home.